This easy pesto pasta recipe makes a terrific side dish or vegetarian main course in no time. It's a great choice for a weeknight dinner when cooking time is limited. Bring a large pot of salted water to a boil. Add pasta and cook according to package directions for al dente. Drain the pasta, and immediately toss with pesto, stirring to coat the pasta completely. Turn into a serving bowl and sprinkle Parmesan cheese over the top. 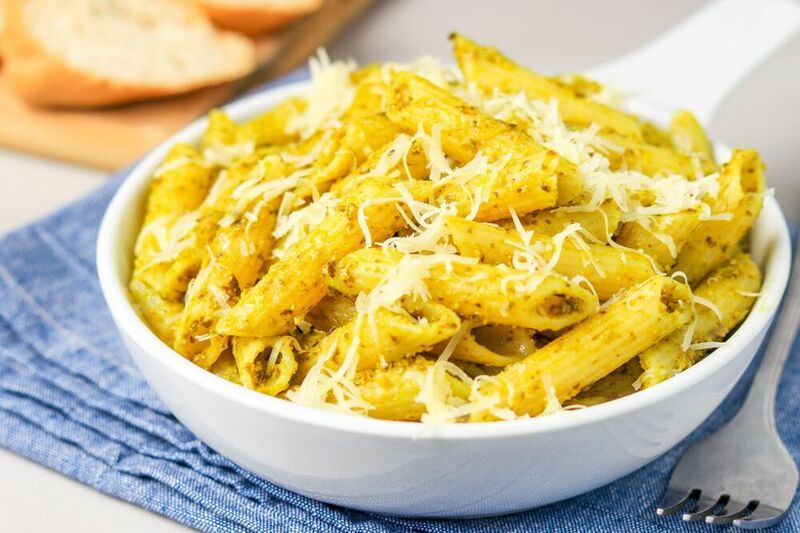 Serve pesto pasta immediately with garlic bread for a light and tasty vegetarian meal, or cover, refrigerate, and rewarm for dinner the next day. This dish can be made the night before, refrigerated, and then rewarmed for dinner the next day. To save time, store-bought basil pesto is used here, but spinach pesto, sun-dried tomato pesto, or homemade pesto can be used to good effect. This recipe easily can be doubled or tripled without sacrificing flavor. If you're a fan of Alfredo sauces, a creamy version of pesto pasta should appeal to you. To alter this recipe, heat 1 tablespoon good-quality olive oil (extra-virgin isn't necessary) in a skillet over medium heat. Whisk in the pesto sauce and heat until warm, and then slowly drizzle in 1/4 cup heavy cream while whisking constantly. If the sauce is too thick, add up to 3 tablespoons water and stir to create a velvety sauce. A rotisserie chicken breast and chopped tomatoes make for a heartier variation. Sauté 1/2 pound deveined, tailless shrimp in 1 to 2 tablespoons hot olive oil for 3 minutes. When done, mix it in with the pesto sauce and combine with the cooked pasta. One-half pound raw chicken cubes can be sautéd in 1 to 2 tablespoons hot olive oil for 6 to 7 minutes or until cooked through and then mixed with the pesto sauce and pasta. Steam or flash fry 2 cups broccoli florets in olive oil for 2 to 3 minutes and add it to the pesto sauce and pasta. Diced cooked, beef, pork, salmon, or any other protein, including drained firm tofu, can be added to the pesto sauce. Pesto is the Italian word for "pounded" and it refers to the traditional method used to prepare this type of uncooked sauce which originated in Genoa, Italy—by pounding the ingredients together in a mortar and pestle. Today, we have the luxury of using a food processor, which makes this a simple, fresh way to dress pasta. Traditional pestos are made with fresh basil, garlic, pine nuts, Parmesan or Pecorino Romano cheese, and olive oil. Modern versions are made with everything from kale, to cilantro, mint, parsley, arugula, spinach, broccoli, broccolini, beet greens, and more in place of the basil. The best type of pasta to use for a sauce like this is something tubular with a hole in the middle or one that has corkscrew twists to soak up more of the sauce. While linguine, spaghetti, fettuccine, and farfalle can be used, any sauce tends to slide off these types of pasta. For maximum sauce absorption, go with penne, fusilli, tortellini, orecchiette, bucatini, cavatappi, ditali, gemeli, gnocchi, and others that twist or have a hole in the middle.